Blind Ambition The White House Years [Audiobook] | Free eBooks Download - EBOOKEE! As White House counsel to Richard Nixon, a young John W. Dean was one of the primary players in the Watergate scandal-and ultimately became the government's key witness in the investigations that ended the Nixon presidency. After the scandal subsided, Dean rebuilt his career, first in business and then as a bestselling author and lecturer. But while the events were still fresh in his mind, he wrote this remarkable memoir about the operations of the Nixon White House and the crisis that led to the president's resignation. 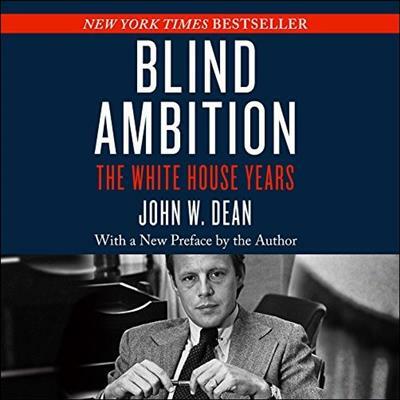 Called "fascinating" by Commentary, which noted that "there can be little doubt of [Dean&apos;s] memory or his candor," Blind Ambition offers an insider's view of the deceptions and machinations that brought down an administration and changed the American people's view of politics and power. It also contains Dean's own unsparing reflections on the personal demons that drove him to participate in the sordid affair. Upon its original publication, Kirkus Reviews hailed it "the flip side of All the President's Men-a document, a minefield, and prime entertainment." Dean is a respected and outspoken advocate for transparency and ethics in government, and the bestselling author of such books as The Nixon Defense, Worse Than Watergate, and Conservatives Without Conscience. Here, in Blind Ambition, he "paints a candid picture of the sickening moral bankruptcy which permeated the White House and to which he contributed. His memory of who said what and to whom is astounding" (Foreign Affairs). 2018-01-06[PDF] Eisenhower: The White House Years. No comments for "Blind Ambition The White House Years [Audiobook]".